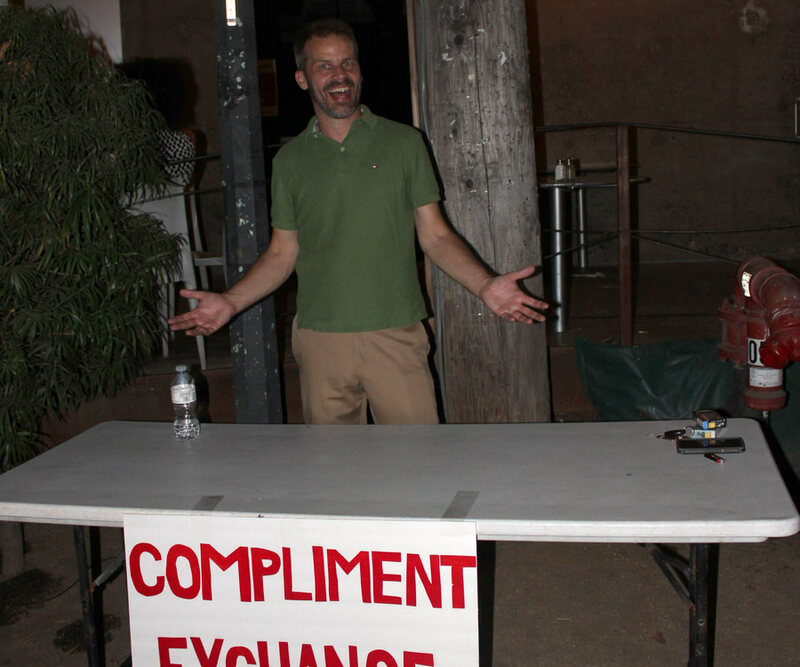 The Sidewalk Compliment Exchange - Night Two and Three! 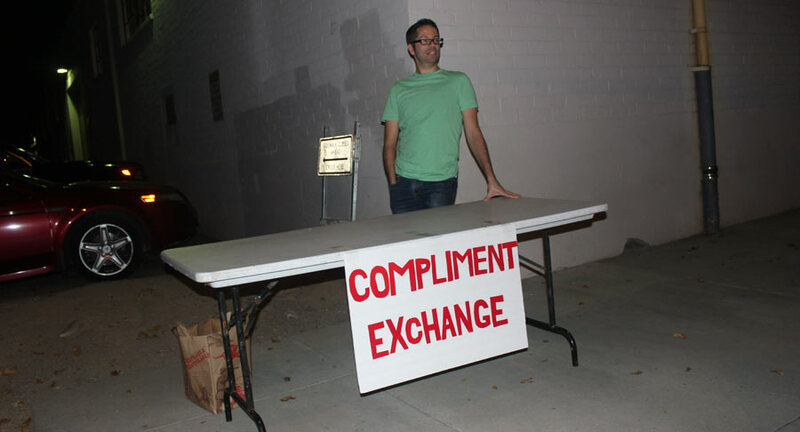 Return of the Compliment Exchange! Running the Compliment Exchange was super fun, so I decided to set it up again! In late September I set up on 20th Street, in front of the Marrs building. Lauren heard me talking about it at dinner and decided to join me in operating the booth. I was excited to find out how crowds would react to a woman complimenting them. Of course everyone loved it. We exchanged compliments with hundreds of people, and it was great! Lauren gave me some great tips, including the suggestion that I refine my "You have an amazing body" compliment to "that dress really compliments your figure". Everyone was nice, but a few men struggled to differentiate between a compliment and genuine romantic interest. 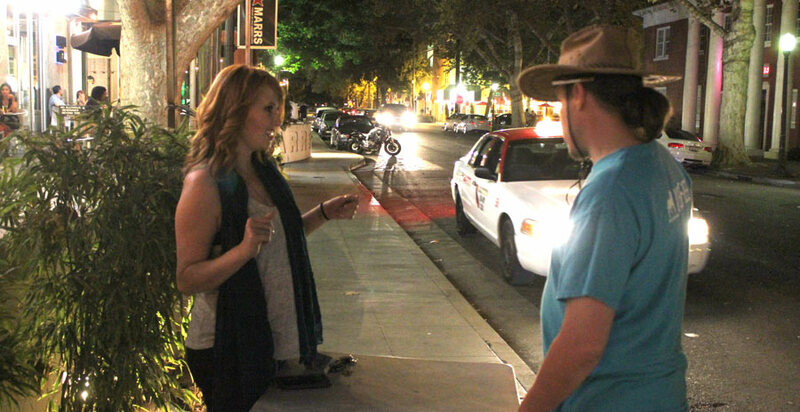 The sidewalk outside of the Marrs Building in Sacramento was a busy area, but because the table was parallel to the sidewalk, a lot of people didn't see us until they were right next to the table. Allowing the public a few seconds to compose a reaction would have made the exchange much better. 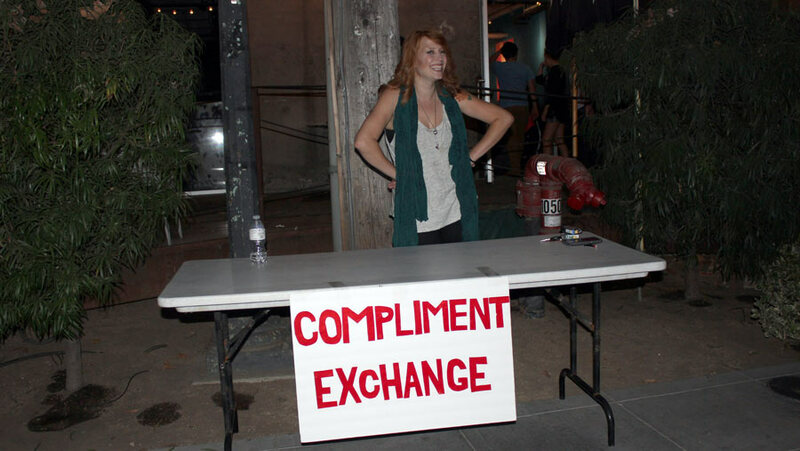 Michelle and Zak were game to try the compliment exchange with me, so wasted no time and set it up immediately! I couldn't imagine a better location that back on R Street outside of the Shady Lady. We were visible from a block away, positioned perfectly to interact with everyone who was heading to the newest part of R Street or headed to the parking lot. 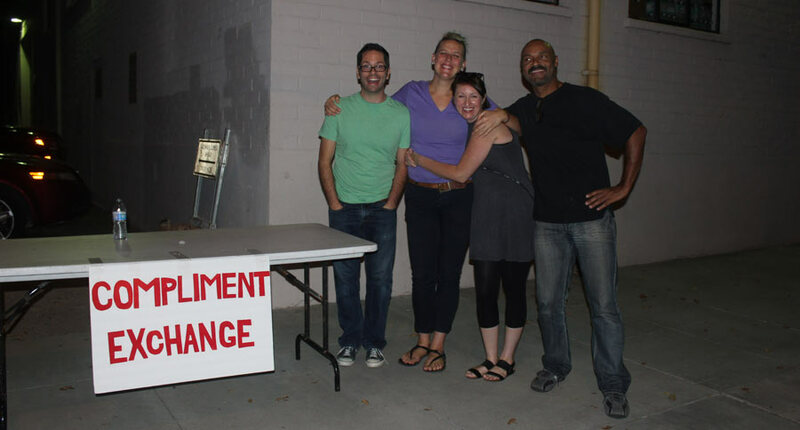 Yes, if two people manning the Compliment Exchange was good, three was even better. Although I didn't snap many pictures, it was another successful night, with people coming in groups and stopping to exchange compliments. 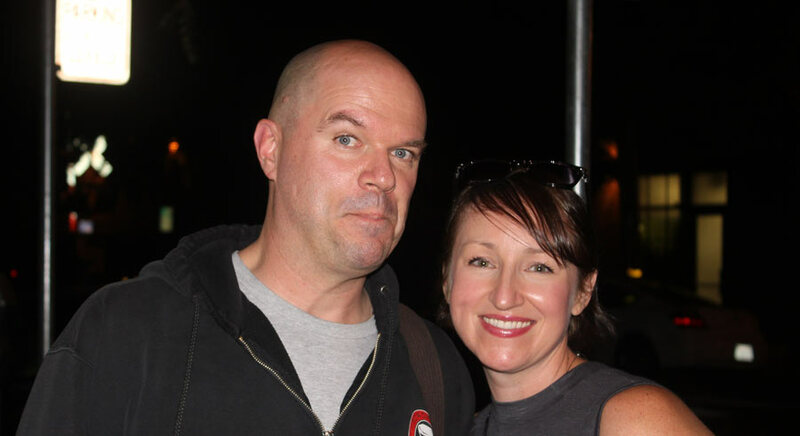 One of my favorite compliment exchanges was with the gentleman posing above with Michelle. He looked skeptical as he silently approached the table, but when he finally spoke, it was to deliver thoughtful, insightful and glowing compliments to Zak, Michelle and I! He was the best complimenter I have ever met! 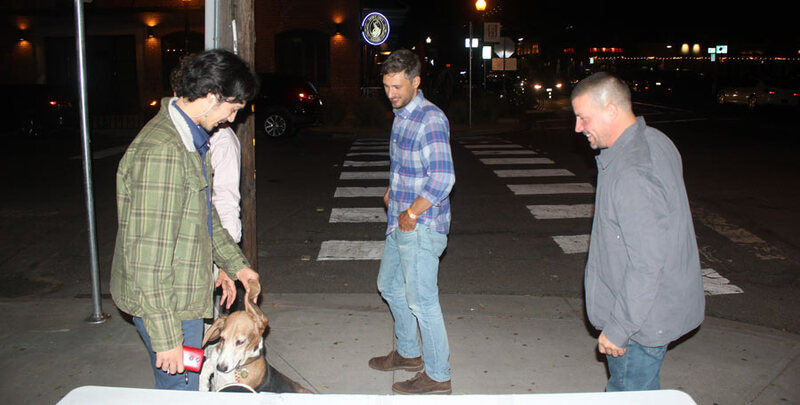 Even dogs got in on the act, accepting a flood of compliments. In the course of a few hours, we exchanged hundreds of compliments and gained some big fans! It was a night of good feelings and fun.